The brake system is one of your vehicle's most vital safety components. See how brakes work. 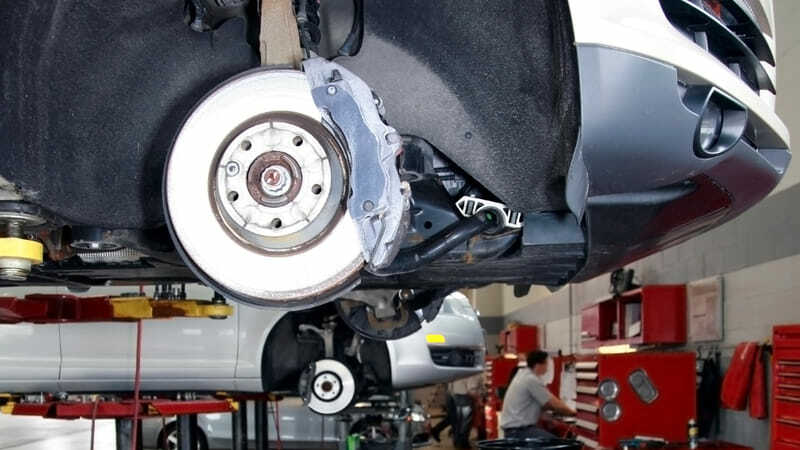 Your braking system has many working parts that experience wear and tear in normal use. ABS (anti-lock braking system) adds to vehicle safety and also increases complexities in brake maintenance. It is essential your brakes are working well at all times. Overly worn brake pads are dangerous and can lead to expensive repairs. If your brakes feel a little soft or if your brakes are squeaking, it's time to get them checked out. How can you tell if your brakes need to be checked? Your car will often "tell you" when your brakes need to be serviced. If your vehicle is showing any of these symptoms, ask Hyack Excel Tire to inspect your brake system. Hyack Excel Tire performs hundreds and hundreds of brake system repairs each year. Hyack Excel Tire's auto techs and mechanics have experience maintaining and servicing front and rear brake systems and all related brake system components such as brake pads, brake shoes, parking brakes, rotors, drums, and hydraulic systems. Call us today to schedule an appointment and we will ensure your braking system is working well. grinding can also occur when a caliper seizes (jams). In any event, you need to have your brakes serviced immediately. If a small amount of gas (air or fluid vapour) gets into the brake system, the brake pedal will feel "mushy" of "soft". If enough air enters the brake system, then it will fail. Air may enter the hydraulic brake system through equipment upgrade, high operating temperature, or equipment failure (broken brake line). Pulsation in your brakes is a sign they are not working properly. Pulsation usually happens when the brakes are not dissipating the heat generated by friction correctly. If you feel a pulsation in your brakes, give Hyack Excel Tire a call immediately. All modern brake systems are hydraulic, meaning it uses fluid to operate. Your vehicle’s brake system uses highly engineered parts and precise movements to stop your vehicle by converting kinetic energy into thermal energy. Pressing down on the brake pedal causes the master cylinder to pressurises a system of hydraulic brake lines each leading to the vehicle’s wheels, where brake pads (or shoes) press against a disc or drum creating the necessary friction needed to slow the car to a stop. Over time, the friction and heat generated in ordinary course wear down the brake shoes, brake pads, and may cause wear and tear to calipers, rotors, and other braking components. While the components comprising each brake system may vary, the warning signs of impending brake repairs are the same. Brake pads provide the friction your vehicle needs to come to a safe stop. But brake pads can become ineffective if they are worn down. At Hyack Excel Tire, we can assess the status of your brake pads and replace them when necessary. Your vehicle’s rotors (or disc brakes) are the primary mechanism by which your car comes to a stop. Without well-functioning rotors, your calipers and brake pads are useless. We take great care in inspecting and servicing your rotors. The brake lines are hydraulic tubes/hoses that supply brake fluid under pressure to the calipers. If your brake lines don’t work, either plugged, pinched or cracked your hydraulic brakes will not work. If your brake fluid levels are dropping, this may be an indication of wearing disc brake pads or brake shoes. Frequent brake fluid top-ups may also be a sign of a leak in your hydraulic system. The calipers are the heart of the brake system. The job of the caliper is to squeeze the brake pads against the rotor creating friction to slow the car. A drum brake refers to a type of brake where brake pads mounted on a curved metal base (brake shoes) are press against the inner surface of the metal drum. As with all brake components, regular maintenance is required to ensure the safe operation of your vehicle. Brake pads are designed to "squeak" or make a “light” grinding noise when they are near the end of their useful life. Check out squeaking brakes as soon as possible. This early warning “squeak” (indicator) could prevent permanent damage to your braking system and save expensive repair costs. Rotors wear over time. Years ago, the repair shop could “turn” rotors by cutting a thin layer of material off to make them smooth and even again. Commonly automakers shave off vehicle weight to help improve fuel economy, many are using "thinner" rotors that are replaced rather than resurfaced. We bleed the brakes to release air (or fluid vapour) that sometimes becomes trapped within the brake lines. ABS (anti-lock braking system) is the most crucial safety systems in modern vehicles. Your ABS will prevent your wheels from locking up (hence the term “anti-lock”), and therefore reducing skidding. We recommend inspecting your ABS on a regular basis, especially in the autumn. Once the roads become icy in winter, your anti-lock brakes could be the only thing saving you from losing control of your car. At Hyack Excel Tire, we can service all aspects of automotive brakes. Our auto techs have the experience and training to keep your vehicle safely on the road. Don’t wait for problems - make a service appointment today! I have been a regular customer with our 2003 Pathfinder for 7-8 years, since Brian was the owner. Now Dave is and Kelly is the service writer. Things have remained consistently the same. Fantastic service based on a level of trust and honesty. Would highly recommend to anyone. Keep up the great work Dave & Kelly!